New Year, New Ideas, New Possiblities Linky! | Primary Planet! 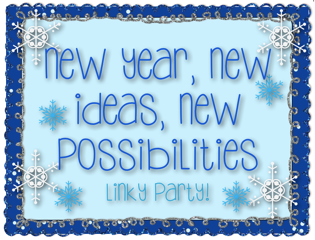 New Year, New Ideas, New Possiblities Linky! Hi, I'm Liz from Polka Dot Firsties. I'm excited to share some activities that my students complete throughout the school year. My room always seems so bare after the holidays. There are so many decorations for Christmas between the reindeer crafts, pretty lights, and gingerbread men. I wanted to share a simple, inexpensive craft that you easily complete with your students. First, fold the coffee filter. Next, have each student color ONE side of the coffee filter. If they accidently color both sides or unfold it, have the student start over. Then spray the colored side of the coffee filter. It needs to be a mist, not a direct shot of water. Make sure to do this over a trash can because the washable ink starts running quickly. Have the student gently press the entire coffee filter. Last, unfold the coffee filter (my students are usually able to do this on their own) and lay flat to dry. I would recommend demonstrating the steps to the students before you get started. Showing them how to gently press the coffee filter is so much better seeing them squeeze the filter and rip it. The first time I showed my students this activity they broke out in applause! This month the students designed snowflakes. I had the students cut out a pattern after they colored on the coffee filter. Here are a few of their creations! You can easily adapt this for different seasons. Other teachers in my school have made fall leaves, poinsettia plants, hearts, and clovers. I hope you enjoyed reading this post! Thank you to Hilary for letting me share on her blog! I love crafts, thank you for sharing! First time joining the linky party and I am learning so much from everyone!See you at the TpT forums! What a cute idea!! I like how it can be used throughout the year in different ways! Super cute and easy:) Thanks for sharing. Those are so cute! I know that my room looked really bare when we got back!